Grab a cup of tea, my friends, I am here to tell you a story. 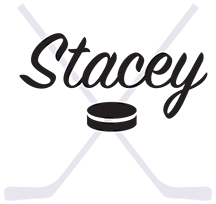 This is the story of how I went from Mom to HockeyMom. Here’s how we got started in hockey. For a lot of my HockeyMom friends, their husbands played hockey. Or they watch hockey. So their kids ask to play hockey. This, to me, is a natural progression and expectation. And one would think that with three boys, I would have known that hockey was inevitable in my house. Except HockeyDad doesn’t watch hockey, the NHL isn’t a “thing” in our house. In fact, up until this year, my boys had never been to an NHL game. I didn’t even think they knew what hockey was. Until Boy #1 came home and asked to play. Yeah. That’s how we got started in hockey. It was just that easy. And just that fast. You see, it doesn’t matter how little you know about a sport. It doesn’t matter if you never speak the word that is the sport. Clearly, it doesn’t matter if you know how to put on the equipment. Because you will inevitably send your children to school. And there’s a really good chance they will make friends. Those friends will tell them about what they do for fun. And then they will make their sport of choice sound like so much fun. It is Canada after all. The winter lasts just about forever and hockey is our winter sport of choice. So the next step was to figure out what our local hockey association was. Thank you, Google for providing the answers. Registration came next, along with a mild panic attack over handing over the cheque to pay for said registration. Because Boy #1 was doing something, Boy #2 was insistent that he do it as well. So that got him started in hockey. Which means that in addition to paying for daycare, we were also paying for two kids in hockey, right out of the gate. Boy #3 was just two years old at this point, but after spending every weekend that winter in a hockey rink, watching the brothers play, it was only natural that he start asking when he could “go hockey” early on. Let me tell you, waiting two years to get on the ice with a hockey stick builds a level of anticipation. His first year in hockey, he was basically vibrating with joy for the first two months. And that, my friends, is when I knew that I’d better get on board with this hockey thing, because it wasn’t going anywhere. We have spent almost every weekend, September through March in hockey rinks. Putting on gear, filling up water bottles, and sitting in the stands. Over the last three and a bit years, there have been times where one of them decides they aren’t going to play. But so far that’s been a temporary feeling, mostly brought on by middle-of-the-season-tireds. At this point, all three still want to play by the time registration rolls around. If one ever decides that hockey isn’t for him, we’ll be exploring a different sport. And I’ll welcome it the same way I have welcomed hockey.